An early morning walk on Takapuna Beach Beach. On Thursday we will say goodbye to New Zealand, our home for the past 32 years. I'm not sad to be leaving. Many an Australian will tell you being Australian never leaves you. Wherever you are in the world you will always think of yourself as an Australian and long for the day when you can return. There are things I will miss. The view of Westhaven Marina as you come into the city over the Harbour Bridge from the North Shore. 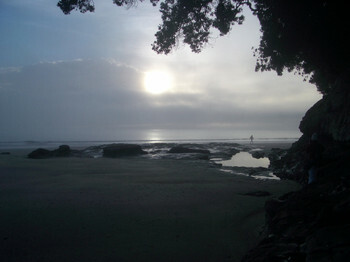 Camping at Raglan. Hiking to the top of Rangitoto. Kayaking on Lake Pupuke. ......mostly I will miss my friends...you know who you are....and I hope you'll come visit.